In 1760, Peter Apple donated one acre of land for a school that was also used as a church on Sundays. This location has been a place of worship for over 250 years and is now known as Apples United Church of Christ. 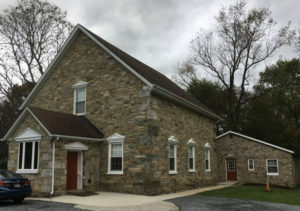 A log church was built on the same ground in 1765; renovations and additions were made until 1826, when a new stone church was built, with much of the labor provided by churchgoers. For several years, the church was known as Troxells Church; the name was chosen by members of the two leading church families: the Troxells and Firors. The original name, Apples, was later restored. Renovations continued over the years and an education building was added in 1965. The adjoining cemetery contains the graves of early settlers, as well as soldiers from the revolutionary and civil wars. Many of the headstones are written in German and several list birth dates in the 1600s. The church historian, Roger Troxell, is available to help people with genealogy research. Keeping the church history alive was only a small part of the conversation with Pastor Laura Robeson and members of the congregation when I met with them after attending a recent Sunday service. They are proud of their commitment to outreach programs. Locally, they support the Thurmont Food Bank and the Ministerium. They also give an annual gift of $500 each to two Catoctin High School (CHS) graduates during the senior awards program; the students are chosen by the CHS guidance counselors. Two international agencies are recipients of their generosity. Through donations to Compassion International, they sponsor a child who is then provided with medical care, food, education, mentoring, and access to the gospel. Donations to Heifer International over the years have provided six ARKs. The gift of an ARK includes two water buffalos, two cows, two sheep, two goats, two oxen, two pigs, two ducks, two guinea pigs, two llamas, two schools of fish, bees, chicks, rabbits, and an animal vet kit. The ARK provides the community with milk, honey, eggs, and wool, and an income from the abundance of goods that they can then sell; it also sustains farming by providing livestock to work the land. Visit the Apples UCC Thurmont Facebook page to see how important music is to the congregation. Videos posted to the site show that they love music and they love to sing. However, during the annual Christmas program on December 23, singing is not the only talent on display. Adults and children are given an opportunity to get up on stage, possibly for the first time. Performances are not limited to singing, storytelling, reciting poetry, or playing an instrument. The real purpose of the event is the guarantee of “thunderous” applause for every performer. Pastor Laura Robeson (front row, right) with members of Apples United Church of Christ.